Please refer to our stock # BK12 when inquiring. 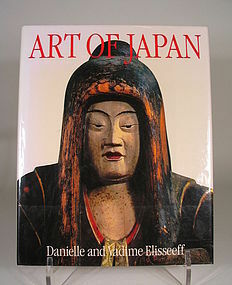 DESCRIPTION: From the jacket: “Art of Japan brings us a sweeping view of the long-lived Japanese culture in all its brilliance and beauty. Never before have all of the major arts been available in a single volume.” This large tome (622 pages) is in beautiful, like new condition. The book covers Japanese history and religion as it specifically relates to its art forms and architecture, and spans time from prehistoric ages through the Meiji Period. A first edition, 1985 Abrams hardbound with dust jacket encased in protective archival Mylar; 794 illustrations with 176 plates in full color, some fold-outs. No marks, inside or out. DIMENSIONS: 12 ½” (32 cm) x 10” (25.5 cm) x 2” (5 cm).